Waste is an inevitable consequence of human activity, and a growing problem of which few people are entirely unaware. We know that finite global resources are under increasing pressure. By 2050, demand for water, food and energy are each projected to be at least 50% higher. We know that poorly managed waste harms the environment. But it is short-sighted to view waste simply as a risk to our security and prosperity. Once we view waste as a resource in its own right – moving beyond the significant but partial challenge of identifying efficiencies – opportunities fast emerge. This is where science, engineering and innovation come in, playing to national strengths. The entire Derbyshire village of Swadlincote, for example, is trialling technologies to reduce food waste. The UK alone generates 6 million tonnes of avoidable food waste every year. It gives rise to at least 17 million tonnes of carbon dioxide equivalents, yet it also has a retail value of some £17 billion. The market for such technologies – including fridges which remind owners of their contents and scales which track domestic waste production - is clear. I have seen other solutions for myself. At a Veolia facility in Southwark, which combines local waste collection with treatment and extraction, I saw how homes can be heated by incinerating the waste they produce. And at the Biorenewables Development Centre at York University, I met researchers pioneering methods of converting plants and bio-wastes into new, greener products such as high-performance recyclable textiles. The prize of moving from wastefulness to resource productivity is the subject of my annual report, due later this year and co-authored with Professor Ian Boyd, Defra’s Chief Scientific Adviser. It will look at waste from multiple angles, encompassing everything from products that 'design out' waste from the very beginning, to new business models premised on service delivery rather than ownership. The report will, we hope, demonstrate how fundamentally re-conceiving our approach to waste can yield considerable economic, environmental and social benefits. Very interesting. It might be an idea to look at how DWP buildings are environmentally friendly. For example replace the lighting with up to date longer lasting eco friendly lighting. What about solar and wind power outlets to power the buildings. Very handy in this day and age when the need to be self sufficient is greater than ever if there is a major disaster. I am sure there is much that can be done within DWP to make a difference in the eco footprint!! ...but I was quite horrified by it. Wirral council are considering changing to three weekly non recyclable waste collections, and having a separate food bin for food scraps etc, but local residents are not happy. My own borough council - Blaenau Gwent - has a poor record for recycling. They certainly don't make it easy for the public, with a complex collection rota, a multiplicity of containers, and the closure of local amenity sites. Rumours also abound that, at present, all our waste actually goes to landfill. 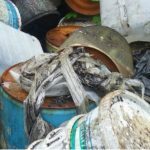 When you take this into account and think of the resources used to clean and treat any waste that really does get recycled, then you start to wonder whether we might be better off burning the lot in specially designed power stations (known as "destructors") and extracting metals and glass from the residue. I believe Germany has done this for decades. It may be the way forward. This is a very interesting article about a subject that needs to have a higher profile than it often receives. I look forward to reading more on this. Yes the amount of food we waste when some people are struggling to get by is appalling! I hope that supermarkets and maufacturers will work to cut food waste. It is about time people saw the value in the waste. Go to any recycling centre and look at the piles of computers that have expensive metals in them, the steel which sells for somewhere around a £100 per ton, stainless steel that sells for £800 a ton... One day, our children will be digging up our landfill sites to extract the value that we dumped as these resources decline. But what really annoys me is the modern - 'don't worry, it gets recycled' excuse to producing more plastic cups, using bottles and wasting paper. Recycling does not make our excessive waste production all okay - it costs resources, time and energy. It is so much better to not produce the waste in the first place. Perhaps it is time to levy punitive duties on paper that does not contain recycled paper, shipping junk from China that we do not need and making single-use items. Encouraging employees to not live 60 miles away from their workplace would also help. Who knows, we may just reduce the road congestion crisis as well with that last one. So lets go back to the old days - using proper cups and real spoons and washing them after use, having squeezy refillable bottles of ketchup in canteens rather than those ridiculous irritating single serving packets that you need five for an actual serving. Milk bottles from glass that get washed and reused as they always did. Finally please lets stop the packaging industry from destroying our world by packing packaging in packing, using cellophane on bananas and adopting the Russian doll approach by putting cardboard boxes in cardboard boxes. I know the directors just want a bonus in order to buy a second superyacht, but all this world needs to survive is a bit less greed and a bit more sense. 30 years ago we were 'nearlythere' they said about the paperless office. I'm still waiting. all other points well made. the packaging industry. labelling industry, plastics industry and the food industry in general will not desist unless legislated to. That I'm afraid will only happen when desperation forces the politicians to act. Not in my lifetime and positive examples are a few and far inbetween. R Dyer, this is a very good article. The way of life in earlier decades certainly contributed to less waste. The advent of plastic and other modern materials, greater wealth and our care-free attitudes have all taken their toll on the environment. But it's not just the environment that's been affected. Humans and animals have also been affected, with waste in landfill sites breaking down and releasing toxic gases and chemicals into the soil and rivers, which eventually find their way into the food chain. As Kuldip points out, we need legislation to force the issue. The public and private sector have failed to address this issue. We've even been sending some of our electrical waste to Indonesia! Human nature needs to be curbed. We're destroying our environment and that of animals. Over 50% of animal species have become extinct over the past 100 years due to accelerating human activity and this continues unabated. The issue of waste is part of a much bigger problem. Interesting article that definitely needs a higher profile within the civil service. I think there should be a commitment that all offices are dragged into the 21st century and made more eco-friendly in terms of heating, lighting, recycling etc. and all new buildings need to be of an eco-friendly standard. An easy way to cut down food waste is to put reasonable use by dates on perishable goods. Yogurt, juices cheese and hams are all treated to last longer, yet given stupidly short dates. Also if the supermarkets were taxed on food wasted, I'm sure they would come up with plenty of ideas to cut the wastage down. Very interesting Article, and as a few on here have already commented, something that deserves a higher profile than it has. Interesting to note that, as the need for more recycling grows and we are all being urged to be more responsible over the amount of waste we produce, that it seems that our efforts are being thwarted by the very people who are "pulling us up" over the amount of waste we produce. Council budgets are being drastically reduced, and among the options being considered, are longer periods between bin collections, this in turn, will lead to some people's bins overflowing, and therefore more rubbish having to be put in Bin Bags, which in turn will encourage street scavengers and vermin, as they are inevitably ripped, and contents emptied onto the streets, and street cleaning services are being reduced, as Councils can no longer afford them, and so continues the Viscious Circle. If we are "really" serious about our commitment to reducing waste, let's have some proof. We all need to remember the three Rs - Reduce, Reuse and Recycle. Reduce the amount of waste we produce, reuse as much of it as possible and then look to recycle it. All well and good but we would not produce so much waste if the computer systems were adequate to store all our information. Currently we have no storage space left to hold any files, and have no working area to store current documents needed on a daily basis. The filing system we have is absolute rubbish and fails more than it works!!! The government should be leading the way to a paperless system therfore funding a system that works! HMRC is leading a cross-government pilot project which aims to transform the way departments deal with surplus stationery, office equipment and furniture. We've introduced an electronic, 'e‐Bay' style system that allows unwanted assets to be offered, free of charge, by and to the 14 departments and agencies taking part. This project will deliver cost savings by cutting procurement costs and the costs associated with the storage of unused assets and also generate environmental benefits by reducing the amount of waste that departments generate and send to landfill, and the level of carbon in the supply chain. The evaluation data from the pilot will give us an indication of whether this kind of system could be rolled out more widely. I really would encourage people to be more conscious of plastic waste. Plastic degrades very slowly- much of it ends up in the world's oceans and can get into the food chain with devastating effects for humans and animals. Of course plastics are essential in many areas of life (e.g. medical services), but much consumption is really unnecessary and very wasteful. Reducing the number of plastic bottles or coffee cups with plastic lids that we purchase is a start (https://www.theguardian.com/environment/2016/mar/18/no-plans-to-tax-coffee-cups-uk-government-says) , reusing plastic bottles for water or for art projects for example (we recently covered several plastic bottles with papier mache, painted them and made them into vases) and then recycling those that we cannot re-use all bring benefits. I recently met with the Director of Cummintere who said that recycled plastics are being used as bricks for house construction in Haiti- for those who have an apetite for more ambition re-use ideas. As a mother, I am especially concerned about the messages that we are conveying to our children about normal consumption. Children's parties are characterised by the giving of expensive plastic gifts that are often not well used. I believe that this sends negative messages to children about resources and the need to be transactional in their social relationships. We have rebelled by asking people not to give presents at our parties, and not giving party bags, just home-made cake. We make it clear that is what is going to happen so no-one gets embarassed. For parties that we attend- the Woodland Trust tree dedication is in my view a great gift and has gone down well with other mums. On a positive note- I have found Freecycle to be an excellent facility for getting rid of things that we no longer want, to people who do want them. It is amazing what people will collect- bubble wrap, used lever arch files etc.